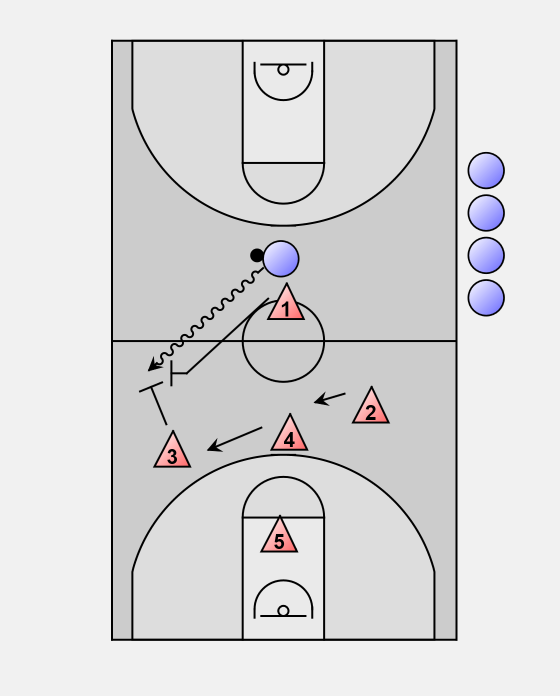 Point defender X1 picks up and pressures the ball handler before centre, forces the dribble to either sideline, and traps with the ball side wing defender once the ball crosses centre. Left wing X3 initially denies the pass into the corner, and does not move up until the ball has crossed centre. 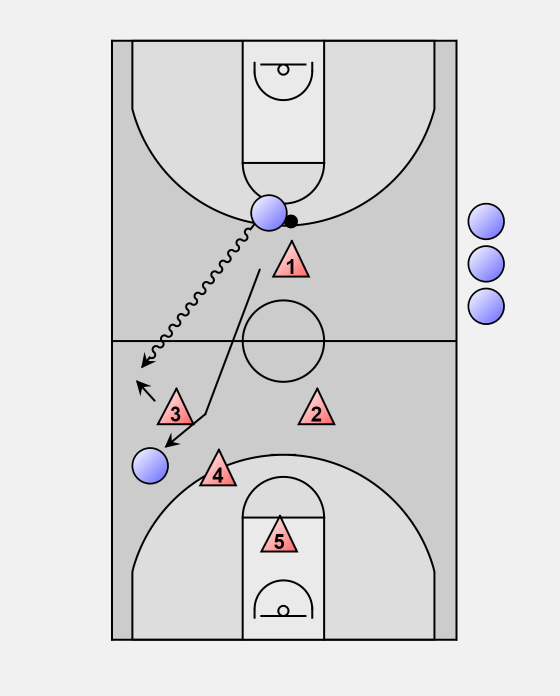 Center X4 stays on the vertical line of the ball as it is brought up the court. 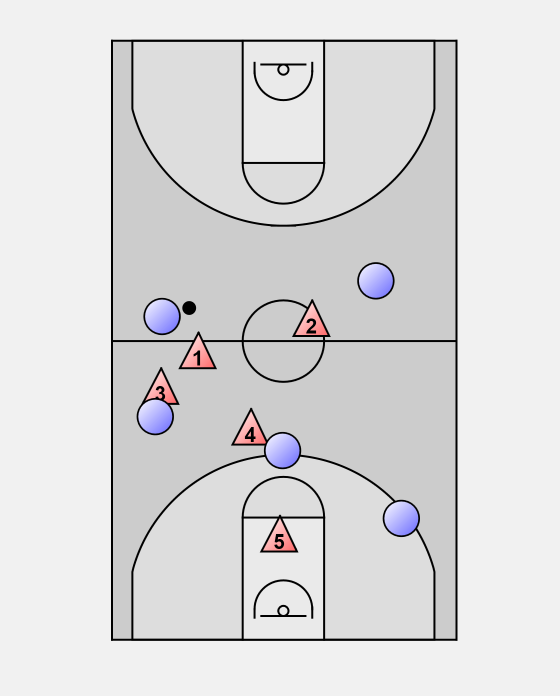 Center X4 has deep sideline and middle responsibility when the trap is set by the point and wing defenders. Weak side right wing defender X2 plays the pass or cut into the middle. X4 and X2 are the interceptors, X5 is the safety. If the attackers reverse the ball before centre, point defender X1 cuts off the return pass and encourages the ball handler to dribble across centre into a trap with right wing defender X2, who cuts off the pass to the corner until the ball crosses centre, then moves up. X4 and X3 are the interceptors behind the trap. A wing player can fake a trap (hedge and recover). 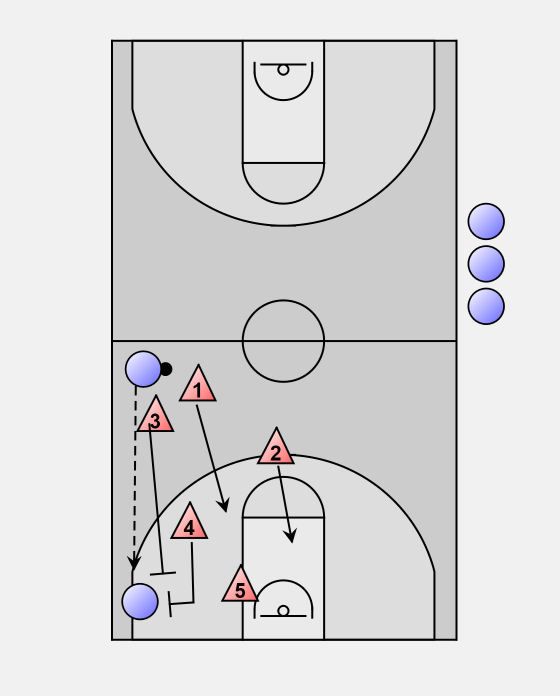 If the ball handler stops and picks up her dribble before mid court, the wing player yells "Dead", point defender X1 smothers her check, and X3, X4 and X2 face guard and deny a pass to other attackers, including any reversal pass. 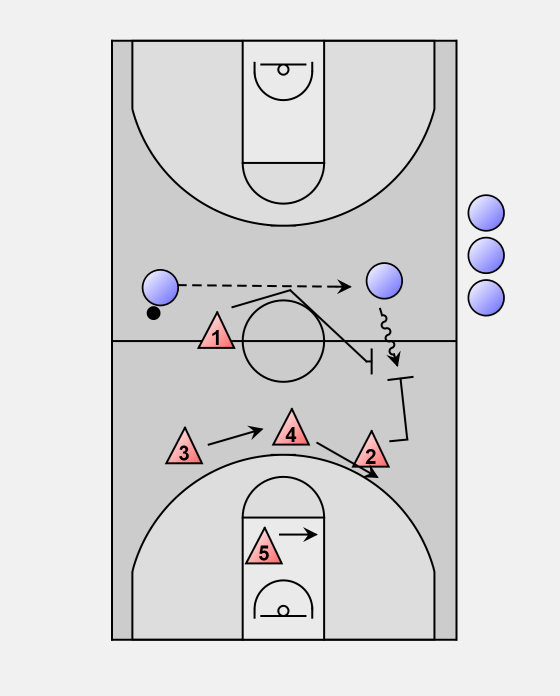 If the ball handler is dribbling at speed or out of control towards a wing player, she can yell "Jump" and jump switch with point defender X1 (exchange positions). If the attackers pass to the corner out of an initial trap, a second trap can be set by left wing X3 and center X4. X1 slides down and joins X5 as an interceptor. Weak side wing X2 slides down to replace X5 as safety. If safety X5 moves out to defend/trap the ball handler in the corner, centre X4 would take her place at the ball side low post.